It happened suddenly. A forceful wind kicked up as the sky darkened. People scrambled, rushing to find warmth indoors while hair blew in several directions, blocking my vision, as I crossed the street. It was a relief to leave the parking lot where winter was leaving its calling card once again. Within minutes, the blustery winds brought in a quick, upstart snowstorm. People inside the funeral parlor where I was, quietly whispered to each other, "It's snowing outside." By the time I left, the snow turned to rain but the cold remained. As the week progressed so did the record cold temperatures. Twitter friends from across the states, shared comments, weather maps, and photos of the deep freeze. 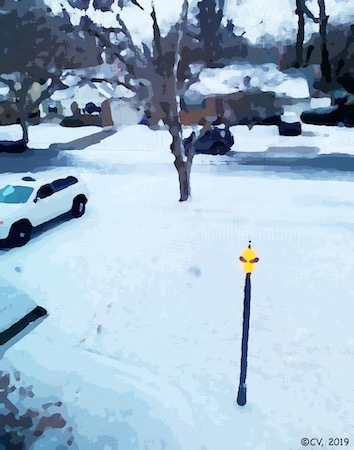 After a storm that deposited a little more than a dusting, I digitized a photo to give it the effect of a typical post-storm, winter day. To follow the wacky weather systems noted in the newspapers, Long Island is back to fluctuating temperatures. So far, we have not brought out the snow shovels. That is so unusual! I am on a quest to capture winter around the globe so join me to create winter digitals, whether you have snow or not! 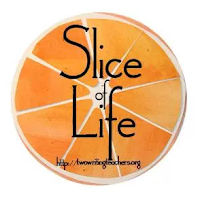 I am joining Two Writing Teachers for Slice of Life Tuesday! I love the look of your digitized photo, Carol, and could really imagine that sudden gusting squall you described. Winter has been so odd this year. The freeze/melt cycles have iced our playing fields so badly that we've had to make them off limits to kids. They're like skating rinks! Ice skating rinks instead of playing fields-you would think you are in Minnesota, Molly. 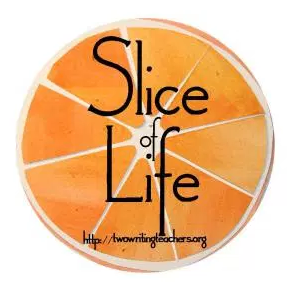 When I was coming home from the Minnesota NCTE convention, I was sitting next to a young man from the idea. He told me that a favorite neighborhood activity each winter is to create an ice skating rink for all the children and adults to use. I enjoyed hearing about how his family enjoyed a very cold winter. Thank you for including me in your post, Carol! This has been one wild winter, for sure! Five days after the Polar Vortex (-22 below), we had a high of 51 degrees and rain! Be careful on the ice; enjoy the INdoor activities. Jennifer, keep those photos coming. Who can believe the extreme change in weather unless you are part of it. Our change from yesterday to today was 20 degrees lower which is certainly as drastic as yours. The rain is coming though. Have a great day. I am amazed with those digitized photos! And I love your poem at the end! Love billowy blankets! I was rereading the poem before and thought about my intent. Billowy blankets both inside and outside are a cuddle cue. Thanks, Trina, for your comments about the work. I appreciate the feedback. Jennifer's image poem shares the icy temperature of Ohio. If you have one, please send it on to me. Your digitizing makes that dusting look like full-on winter! Nicely re-imagined. Thanks for stopping by, Brian. It is amazing how digitizing a photo brings on a new look, new mood, new sensations.